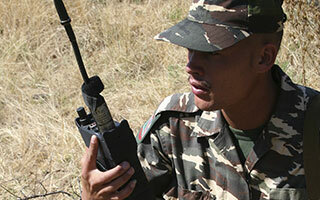 Namibia-based Sat-Com produces high-performance communication equipment for military and commercial customers, and is using XJTAG boundary scan to improve testing of the complex digital processing subsystems at the heart of its equipment. XJTAG helps Sat-Com utilise its in-house design, test-engineering and production skills efficiently, and to keep its test IP secure. The high-performance processing engines at the heart of Sat-Com systems are typically based around an advanced DSP and memory subsystem, often with a companion chip such as a microcontroller or FPGA, as well as various application-specific ICs and devices such as memory-card interfaces and I/O expanders. Testing of the prototypes and production boards, which are usually built in low volumes, has traditionally been carried out using equipment such as communications analysers and spectrum analysers. To speed up testing of prototypes, and also to establish a test regime suitable for use by the contract manufacturer, Sat-Com’s engineers are using XJTAG boundary scan testing. The XJTAG platform includes a powerful development system that can be used for creating and executing tests in a R&D environment, and also offers the XJRunner run-time environment that is ideal for use on electronic production lines. XJTAG boundary scan can help enhance productivity in development, production, and service or repair activities. Engineers can verify their hardware designs early, even before firmware is ready, using the XJDeveloper graphical tools with built-in connection tests and the large library of test scripts for standard devices to ensure that all connections are correct and the board is able to function. In production, each board can be connected to XJTAG using a single connector, without needing a custom test fixture, to test devices on the boundary scan chain as well as non-JTAG devices on connected nets. Fault-finding returned boards is also fast and easy, and XJTAG can run connection tests and test non-JTAG devices. “XJTAG helps us pinpoint any faults extremely accurately”, adds Maarten Venter. “Our technicians use it to fault-find boards quickly.” He adds that the support provided by XJTAG and its distributor for southern Africa, ASIC Design Services, has enabled Sat-Com’s engineers to become familiar with the system and learn how to use powerful features like the XJEase high-level test development language. As Sat-Com’s engineers now look forward to engaging with a contract manufacturing partner, Maarten Venter is expecting XJTAG to help the teams interact smoothly. “The XJRunner system provides a cost-effective environment that allows us to keep our test IP confidential, which helps to protect Sat-Com and our customers in the highly sensitive markets we serve”, he says. XJTAG helps us pinpoint any faults extremely accurately. Our technicians can now fault-find boards quickly without help from the designer. Since installing XJTAG boundary scan, we have been able to significantly increase test coverage and dramatically shorten the time taken to test each board. XJTAG is very easy to use and allows us to determine quickly whether a board is capable of functioning or not. The XJRunner system provides a cost-effective environment that allows us to keep our test IP confidential, which helps to protect Sat-Com and our clients in the highly sensitive markets we serve. Sat-Com is a designer and systems integrator focused on state-of-the-art communication equipment such as Software Defined Radio (SDR) and high-power RF amplifiers. Sat-Com also provides turnkey communications systems for both commercial and military applications such as broadcast, Very Small Aperture Terminal (VSAT) satellite communication equipment, and point-to-point RF links.